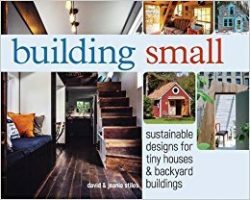 We talk with the mavens of backyard building Jean and David Stiles about their new book, Building Small. Then, the Airstream is the icon of travel trailers with a passionately devoted following. We talk all things Airstream with Karen Flett. Her book is Living the Airstream Life. Where Francesca lives, in some neighborhoods (not hers) house buyers tear down 10 year old McMansions to put up even larger mega McMansions. Seven bathrooms aren’t enough — 10 or 12 are the new normal. Such is life in the Hamptons. But could this era of excess square footage be coming to an end? More and more people are turning to simplifying their lives, whether out of ethics or necessity — or both. We all need to live more lightly on the planet and many can’t afford to live large anymore. We’ve already talked on Writer’s Voice about tiny houses — dwellings so small, they can be transported on a flatbed trailer. But those houses are really tiny — many of them well under 100 square feet, making them difficult for all but the most pared down and agile to live in them. They’ve just come out with their 17th book, which aims for the sweet spot between too tiny and bigger than you need: the small house you can build yourself for not a whole lot of money. It’s called Building Small – Tiny Houses and Backyard Building Designs. The designs range from traditional Tudor timber-frame to whimsical but practical structures that can be added to or moved around like building blocks. And the book gives detailed step-by-step instructions that give even the klutziest amateur the knowledge to build her or his dream small house. With its distinctive silver-bullet shaped profile, the Airstream has been an integral part of the American recreational landscape for more than eighty-five years. Since the 1930s, thousands of Americans have traveled the highways and byways of our land in these trailers, which they often modify to their own individual tastes. Today, these beautifully designed nostalgia-laden vehicles are more popular than ever. 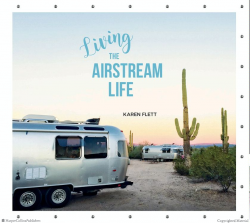 Accompanied by loads of photos, , Karen Flett’s Living the Airstream Life tells the unique story of the designers who created the Airstream and gives tips for Airstream wannabes on how to become part of the community. Next week, we talk with John Duberstein about his late wife Nina Rigg’s beautifully written memoir of living and dying, THE BRIGHT HOUR.